'Crazy Rich Asians' stars Constance Wu and Gemma Chan wore OSCAR DE LA RENTA at the 25th Screen Actors Guild Awards this evening(January 27th) at the Shrine Auditorium and Expo Hall in LA. 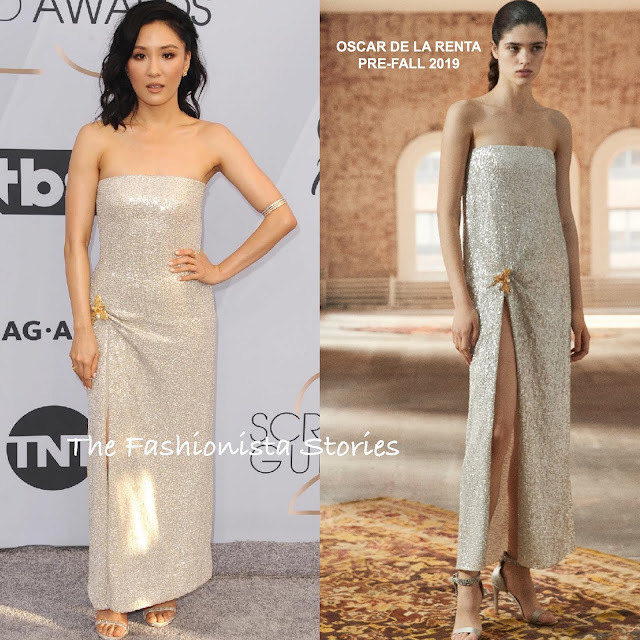 Constance Wu loves to wear sparkles which is why this OSCAR DE LA RENTA PRE-FALL 2019 silver sequin dress is right up her style alley. Her bardot column dress featured a split detail which was adorned with a gold embellished brooch. Accessorized with HARRY WINSTON jewelry, an AMANDA PEARL clutch, and STUART WEITZMAN sandals, she finished up with a flawless beauty look. Gemma Chan wore a custom pink one-shoulder high-low hem gown featuring a pleated tier skirt, that flowed into a train and a contrasting black waistband. Instead of wearing ankle strap sandals, she opted for simple black pumps.